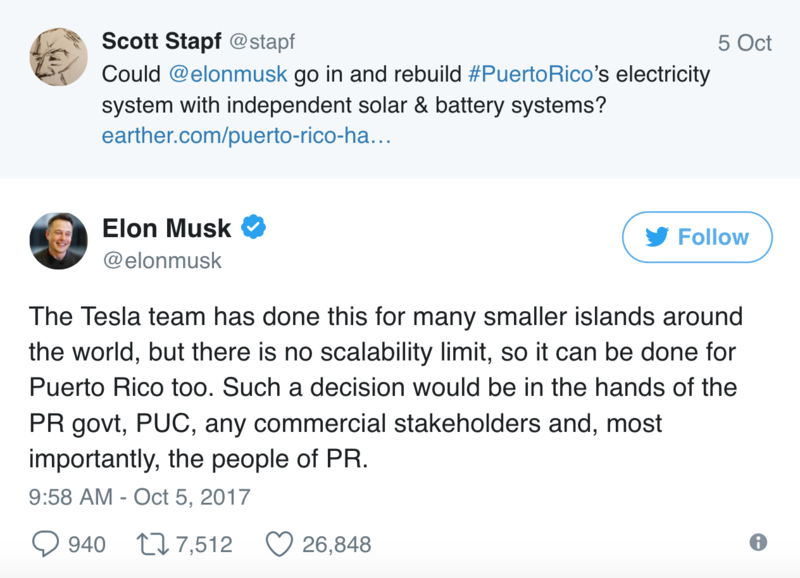 In the same week that Goldman Sachs predicted Tesla stock to drop by nearly 50%, Elon Musk has promised to Power Puerto Rico. It’s very clear even to neophyte investors that Tesla’s stock is in bubble territory somewhere outside the stratosphere. Goldman cites massive cash burn, “production issues” with hundred kilowatt-hour battery packs — another likely miss of Musk’s grand annual production targets for Tesla’s Model 3 — as well as the need to raise yet more cash in the first quarter of 2018. Tesla’s market capitalization has exceeded that of General Motors, which is gob-smacking when one considers that Tesla has delivered fewer than 300,000 cars in its history, compared to GM’s annual production output of over 12 million vehicles. Musk has a career of making outrageously bold claims, over-promising and always under-delivering — at a huge cost to taxpayers. In fact taxpayer subsidies are at the heart of Elon musk’s business models and without them Tesla would’ve been bankrupt long ago. The technology that Musk is suggesting is experimental and has never been used in large-scale projects. To allow Puerto Rico’s power grid to be utilized as a test case — at taxpayer expense no less — is dangerous and ludicrous. SolarCity was headed into bankruptcy when it’s owner Elon Musk used influence to have Tesla purchase the cash burning machine. Notice that Musk provided no indication who, exactly, in any of the numerous local governments gave this green light. Why? Are these the same anonymous sources as the White House leaks? The Swiss National Bank has already invested in Tesla. Perhaps the European Central Bank, the Federal Reserve and the Bank of Japan will offer Elon Musk hundreds of billions of dollars to fund further experimental projects thus picking winners and losers in markets rather than allowing capitalism to decide which businesses survive based on a solid track record of profits — rather than losses followed by hype, spin and public relations. Tesla, SolarCity and SpaceX are perfect speculative vehicles that illustrate the reckless bubbles created in a chase for yield created by our global central banks. Elon musk is considered a “walking on water” media darling by the financial news talking heads. He is an oracle a visionary because it’s different this time, silly. I’ve said this before: it’s never different, not this time, not next time, not anytime. Beware — many a talented snake oil salesmen have convinced investors to part with their hard-earned capital. Don’t be confused — or fooled — if it looks, feels and seems like a Ponzi scheme it usually is.. Follow the cash flows, and pay attention to the sustainability of the business without taxpayer or government subsidies. Unfortunately, no one wants to miss out because the ride is always fantastic — like a Bentley convertible on a spring-day in Central Park — but Ponzi schemes always end in disaster and this time will be no different.